A rare 100-foot high fire tornado – known as a ‘fire devil’ – formed in the Australian outback. The names of the eight South Africans killed in a suicide bomb attack in Kabul, Afghanistan, have been released by the department of international relations and co-operation. “The Department has consulted with the families of the deceased and hereby releases their names with permission from their families,” said spokesman Nelson Kgwete in a statement on Wednesday. The department was working with the private aviation company that employed the victims and Afghanistan authorities, and was rendering consular assistance to the families. “This includes arrangements for the repatriation of the mortal remains of the deceased,” said Kgwete. The government expressed its deepest condolences to the families, friends and colleagues of those killed and condemned the use of violence. Traditional Anglican Communion Bishop Louis Campese was speechless on Sunday, Sept. 16, as he joyfully witnessed his flock of American Anglicans be shepherded into the Roman Catholic Church. Currently, neither Bishop Campese nor any his former cathedral clergy – Fr. William Holiday, Fr. Scott Whitmore and Fr. Jason McCrimmon – have been ordained as Catholic clergy. He is praying that Fr. Holiday will be able to be ordained as a Catholic cleric in the not-too-distant future, but Fr. Whitmore has decided to take a little more time to discern the perimeters of his priesthood, while Fr. McCrimmon has chosen to remain Anglican and live out his priestly ministry as a chaplain in the US Navy. VirtueOnline has the whole piece here. 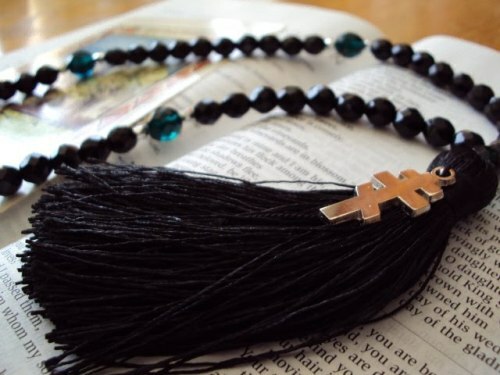 The prayer rope was formed by St. Pachomius in the fourth century. The rope is used with the Jesus Prayer: “Lord Jesus Christ, Son of God, have mercy on me, a sinner.” Historically it typically had 100 knots, although prayer ropes with 300, 50, or 33 knots or, less commonly, 250 or 12 can also be found in use today. Moscow (Reuters) – Access to YouTube across Russia could be blocked under a new law that takes effect on November 1 if the portal does not remove a video mocking the Prophet Mohammad, the country’s communications minister said on Tuesday. The video, which sparked violent protests in many Muslim countries, has been deemed extremist by Russian prosecutors who have now asked the court to ban it. Under new legislation, Internet sites carrying content banned in Russia would be included on a special register, after which Internet providers would have one day to block access. Google Inc, the owner of YouTube, rejected a request by the White House to remove the video but decided to block it in a number of Muslim countries including Egypt and Libya where U.S. embassies have been stormed by protesters. Russia is home to 20 million Muslims. The court now has five days to make a ruling on whether the film is extremist but legal practice shows that on such matters Russian courts usually side with the prosecutors. Google’s Moscow office confirmed they received the prosecutors’ warning but said that such matters are handled at the company’s headquarters. Previously Russia has never blocked access to Google services. Some influential Russian politicians, including former Deputy Prime Minister Igor Sechin, blamed social networks and popular Internet services for helping to stir dissent in developing countries including Russia. Last year Russia’s domestic security service called for access to encrypted communication providers such as Gmail, Hotmail and Skype, saying the uncontrolled use of such services could threaten national security. Anti-Kremlin opposition groups, which staged the biggest protests during President Vladimir Putin’s 12-year rule over the past several months, has extensively used Internet services to organize mass rallies and spread their message. The Kremlin responded by rushing through parliament a string of restrictive laws which opposition described as a crackdown on dissent.